We’d love your help. Let us know what’s wrong with this preview of Anarchy Alive! by Uri Gordon. Anarchist politics are at the heart of today’s most vibrant and radical social movements. From squatted social centres and community gardens to acts of sabotage and raucous summit blockades, anarchist groups and networks are spreading an ethos of direct action, non-hierarchical organizing and self-liberation that has redefined revolutionary struggle for the 21st century. An Anarchist politics are at the heart of today’s most vibrant and radical social movements. From squatted social centres and community gardens to acts of sabotage and raucous summit blockades, anarchist groups and networks are spreading an ethos of direct action, non-hierarchical organizing and self-liberation that has redefined revolutionary struggle for the 21st century. Anarchy Alive! is a fascinating, in-depth look at the practice and theory of contemporary anarchism. Uri Gordon draws on his activist experience and on interviews, discussions and a vast selection of recent literature to explore the activities, cultures and agendas shaping today’s explosive anti-authoritarian revival. Anarchy Alive! also addresses some of the most tense debates in the contemporary movement, using a theory based on practice to provocatively reshape anarchist discussions of leadership, violence, technology and nationalism. 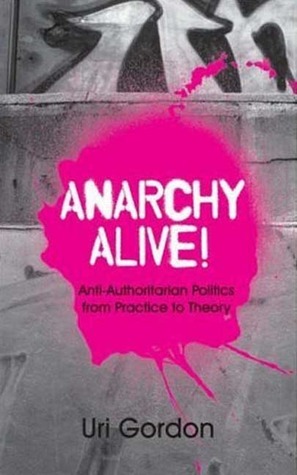 To ask other readers questions about Anarchy Alive!, please sign up. Be the first to ask a question about Anarchy Alive! I would have given four stars to this title, but I decided instead to substract that fourth star out because of the academic tone present throughout the book and which came as totally unexpected given its title and cover (after all, they always say "don't judge a book by the cover", don't they?). This academic ("anarchademic"?) tone I'm talking about made me re-read quite a few of the passages three time to fully grasp their meaning beyond their conceptual abstractions. Of course, this isn't some I would have given four stars to this title, but I decided instead to substract that fourth star out because of the academic tone present throughout the book and which came as totally unexpected given its title and cover (after all, they always say "don't judge a book by the cover", don't they?). This academic ("anarchademic"?) tone I'm talking about made me re-read quite a few of the passages three time to fully grasp their meaning beyond their conceptual abstractions. Of course, this isn't something negative by itself. It's just that I thought the mood of this book would be different. Having gotten this "complaint" out of the way, I must say that I did earn quite a few insights and new perspectives about the whole anarchist subject, which has made me respect it much more as a political philosophy, one I can relate to. However, living where I live, Venezuela, this kind of political thinking is way beyond our possibilities right now. Anarchism here would be extremely dangerous, we're just not ready for it, we're like a society with the mind of a child becoming a teenager, without a clear understanding of responsibility. Anyway, this doesn't mean we cannot aim toward the goal of a stateless society and grow in the process. This is an easy read and a great overview of power, violence, and technology issues from the perspective of contemporary anarchist thought and action. The academic tone in this is so bothersome. To be honest, the first chapter seemed like it could have come out of some police intelligence briefing, describing all the particular nuances of anarchist association. The chapter on violence was unnecessary, as if attempting to define violence means anything anymore. The chapter on the Israel-Palestine conflict was okay, and I appreciated the jab at Wayne Price, but to suggest that a Palestinian state is somehow the solution to the conflict is just s The academic tone in this is so bothersome. To be honest, the first chapter seemed like it could have come out of some police intelligence briefing, describing all the particular nuances of anarchist association. The chapter on violence was unnecessary, as if attempting to define violence means anything anymore. The chapter on the Israel-Palestine conflict was okay, and I appreciated the jab at Wayne Price, but to suggest that a Palestinian state is somehow the solution to the conflict is just strange to me. A fascinating look at recent anarchist activism used to theorize about practical tactics. The chapter on violence was especially interesting -- as was the practical take on anti-occupation activism in Palestine/Israel.